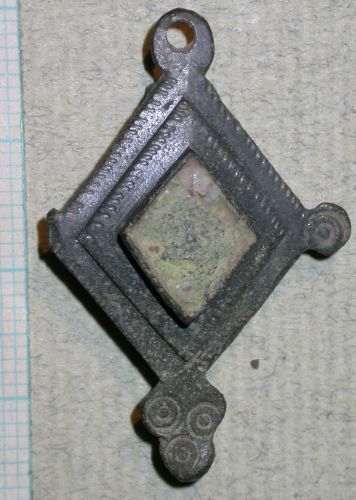 A Roman copper-alloy lozenge-shaped plate brooch. The brooch has four projecting terminals, although one side projection is now missing. It is 36mm long and 25mm wide. The projection at the top is pierced for attachment (?to a chain). The lowest is tri-lobate and has three stamped ring-and-dot motifs. The one surviving side projection has a single ring-and-dot. The central raised setting contains the remains of an enamel inlay which appears white, and which itself sits on a raised platform. This platform and the outer edge of the brooch are decorated with a series of closely-spaced punched lines, each c1mm long. The spring and pin are missing. 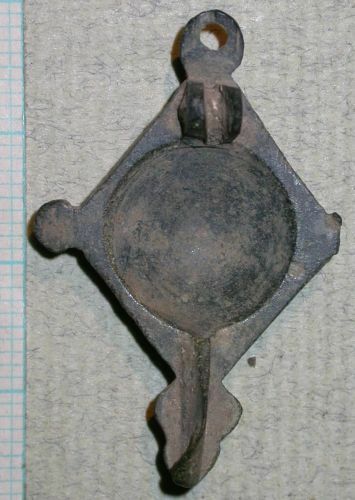 The pin was held between two close-set semi-circular lugs. The catchplate is intact.